Phase 1 — Last Wednesday and Thursday, Seattle and Oakland split a pair of games at the Tokyo Dome in Japan. Apparently these were top secret, because nobody knew about them. 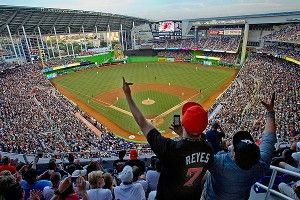 Phase 2 — Wednesday night, St. Louis opened up Marlins Park with a 4-1 win. Phase 3 — A few more teams, 13 in all, play their first game today, starting with Boston and Detroit at 1 p.m. ET. Phase 4 — Everyone else plays tomorrow. I guess the Opening Day brand isn’t too important to MLB, which is kind of insane when you think about the fact that over a 162-game season, there aren’t many branding opportunities. You’ve got the playoff chase, the postseason and World Series, the All-Star Game, and Opening Day. Maybe bat day in Oakland. Maybe. Wouldn’t it make sense to have a festive, all-encompassing, heavily branded curtain-raiser? In baseball’s American prime, Opening Day was akin to a national holiday. Today, it sneaks up on you, and the season starts with a whimper. For a sport with diminishing popularity, that’s not good news. With that in mind, here are five possibly ridiculous, possibly stupid, possibly visionary ideas on how to restore Opening Day to its high status. In 2013, Houston will move to the American League (which will be even harder to remember than this Miami Marlins thing), meaning that the number will be equal — 15 clubs in each league. Have each team play against its Interleague rival, and whichever league wins the most games on Opening Day has homefield advantage in the World Series. If they tie 15-15, homefield goes to the league that held it the previous year, Ryder Cup style. B — Pick five players total, from any team, who will get more than one hit. Four points for each correct answer. Negative two points if any of the players go hitless. C — Pick five pitchers total who will last into the eighth inning. Four points for each correct answer, negative two points if they’re gone before the sixth. I’m sure the best gambling minds can improve the hell out of this, but it’s a start. While I’m here, I’d like to share an idea for another MLB gambling idea that only loosely involves Opening Day — the Five Strikes pool. It’s nothing revolutionary — just a basic survival pool, but unlike the NFL version, you have five strikes. So you pick one winner every day, and when you get five wrong, you’re out. You can’t pick the same team twice in one week, but after the week resets on Monday, they’re eligible again. I’m mostly just curious to see how long this would last with a group of about 15 people. This is a tough sell, I realize, since Opening Day is one of the few times every season when the struggling teams can count on a full house. But it’s all about creating atmosphere, and the PR boost from having fans camp out for tickets overnight (along with the extremists who will be there in a tent for two weeks) will be worth the lost revenue. On the flip side, hold free parties with big screens at the 15 stadiums not being used on Opening Day. Shut down the concessions stands and allow fans to bring their own food and drink. The first batter of each game, for both teams, has to be a non-roster player that has never played professional baseball and lives in the team’s home city. This is just one at-bat, after which the ordinary citizen is immediately subbed out. They never play in the field, and they never bat again. All he or she can do is bat once and run the bases if they happens to get on. Hold a one-day tryout for this spot a week before the season. I’m mostly just curious if the Ordinary Citizen would ever get a hit or a walk, and the humiliation factor for the pitcher who gave it up would be fantastic. Or maybe some angry pitcher like A.J. Burnett would hate it so much that they’d bean the Ordinary Citizen. Would this idea ruin the integrity of the game? Possibly. Would it be amazing viewing? Would you watch a compilation video of the 30 Ordinary Citizen at-bats over and over and over again? Yes, you would. OK, that wasn’t an “idea” as much as an impossible suggestion. Still, if we employ the other four steps, plays like Buehrle’s won’t be necessary. Opening Day will regain its legend. Why Was Gregg Williams Quoting Memoirs of a Geisha?